1. 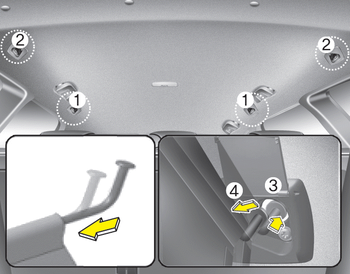 Open the cover (if equipped) for the holder position (1) or (2) you want to install. 2. Compress the one side net upper shaft to length direction before insert the net upper shaft into the large hole (3) and then secure by sliding into the small hole (4). 3. 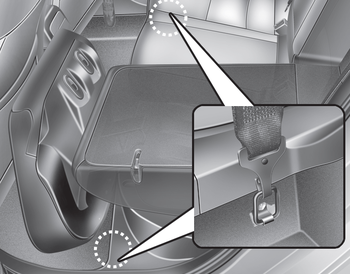 Hang the net strap hooks in the corresponding hook holders on the floor behind the front seat or rear seat. This symbol indicates the position of the hook holders on the floor behind the rear seat. 4. Fasten the straps, by using the adjuster (1). Make sure that there is no slack in the barrier net by fastening the strap securely when installing the net. The strap should be fastened after confirming that the hook is inserted into the upper hook holder securely. Make sure that the seatbacks are locked securely. Do not put passengers in the rear seat or cargo area behind the barrier net. 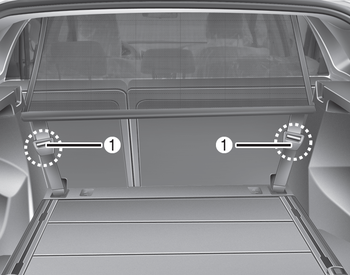 Do not put passenger in the rear centre seat when the barrier net is installed behind the rear seats. 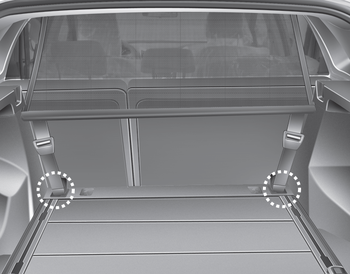 The barrier net may interfere with use of the rear centre safety belt. Do not load cargo in the area higher than the barrier net's upper end. Do not load heavy cargo in the area higher than the seatback to avoid accident even if the barrier net is installed. Do not load cargo which has sharp edge that can pass through the barrier net. Do not apply excessive force to the barrier net by hanging on to the net or by suspending heavy cargo and so on.